So, I am on the Tea Party Express bus traveling to our next rally in Omaha, NE when the faces of black democrats Maxine Waters and Charlie Rangel appear on TV on the Fox News channel. 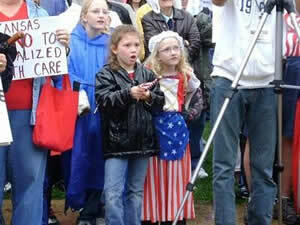 Both were saying racism was at the core of the Tea Party protester's disagreement with Obama. Please excuse my crudeness, but I wanted to puke. These two race exploiters are calling the Tea Party protesters racist. Meanwhile, I am a black performer/activist traveling on my third national Tea Party Express tour. We just finished our rally in North Platte, NE. Two white families asked me to hold their new born babies and pose for pictures. Excited white grandparents who are fans of my articles and music asked me to pose for pictures with them and their grand kids. Numerous white patriots shook my hand with tears in their eyes thanked me for what I was doing for our country. A white woman who said she was 86 years old gave me a big hug in thanks formy efforts. Polatik, our young Hispanic conservative rapper, got his usual huge positive response from the mostly older white crowd. These are the decent hard working great Americans, Waters, Rangel and the left continuously attempt to portray as racist. Waters and Rangel are disgusting people willing to shamefully play the race card whenever it serves their purpose. And their purpose is to ram as much of Obama's far left radical government take over of our lives down our throats as possible without opposition. These arrogant elitists believe they know what is best for our lives. They believe in "social justice" which means taking from achievers and redistributing to non achievers; totally un-American and an anathema to the nurturing of the humanspirit. Waters and Rangel are both poster kids for why we must vote out characterless politicians who freely exploit race, class envy or whatever to divide Americans and further their anti-America agenda. Someone informed me the left wing Huffington Post blog trashed me for my proclaiming at Tea Parties that I'm an American rather than a hyphenated African-American. Perhaps, one of the left wing blogs inspired the hate emails I have received. They call me everything from an idiot to an M F-ing stupid "N" word. Why does simply calling myself an American inspire such anger and rage from the left? And yet, the media lords the left for their tolerance and compassion. The left attempts to brand us tea party patriots as haters, while in reality they are the ones spewing hate from deep within their souls. Since I began traveling with the Tea Party Express, (over a hundred rallies), I have been surrounded by great Americans who love their country and simply do not want to see it transformed into Europe. Got to run, talk to y'all later. Waters and Rangel are disgusting people willing to shamefully play the race card whenever it serves their purpose.